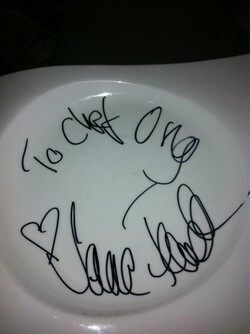 The plate Jane Fonda signed for chef Ong. She also paid a repeat visit to Chez Panisse (revealed in one of her own tweets, in which she said, “No trip to San Francisco is complete without a visit to Chez Panisse! mmmm.”). 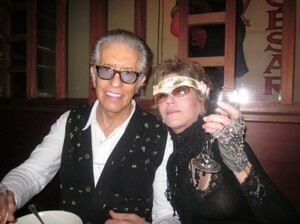 Jane Fonda striking an OG pose with partner Richard Perry; photo from JaneFonda.com.